On this date in 1945 Hungarian-born physicist and inventor Leó Szilárd drafted the first of two ver­sions of a peti­tion to Presi­dent Harry S. Truman, urging him not to use the atomic bomb on Japan before that nation had been given a chance to sur­render. It was Szilárd who, in 1933, had con­ceived the nuclear chain reaction and patented the idea of a nuclear reactor with Italian-born Enrico Fermi. And it was Szilárd who, in July 1939, wrote the letter for Albert Einstein’s signa­ture that resulted in the super-secret Man­hat­tan Pro­ject, which built the atomic bomb—a weapon that was more power­ful, more poten­tially devas­tating, and undeni­ably more horrifying than any bomb humans had ever devised before. By 1945, however, Szilárd was firmly convinced that using a nuclear wea­pon on Japan would carry the world further down a path of ruth­less­ness that began with Adolf Hitler’s Germany raining bombs on Polish and British cities in the early days of the Second World War in Europe. In reaction to the final ver­sion of the peti­tion, signed and dated July 17, 1945, by 70 leading scien­tists who were in­volved in the atomic bomb research pro­ject, Brig. Gen. Leslie Groves, the director of the $2 billion-plus Man­hat­tan Pro­ject, unsuc­cess­fully sought evi­dence of Szilárd vio­lating the U.S. Espi­o­nage Act. Most of the signers were punished by losing their jobs in weapons work. In the grand scheme, the con­cerns of the dis­senting scien­tists raised nary an eye­brow on the faces of policy­makers who bore responsibility for winning the war. In the mean­time, on August 6, 1945, a specially modi­fied B‑29 Super­for­tress named Enola Gay dropped the first of two atomic bombs on Japan, “Little Boy,” a five-ton bomb of which less than a kilo­gram under­went nuclear fis­sion. Yet “Little Boy” pro­duced enough energy to kill more than 90,000 citi­zens of Hiro­shima out­right and injure over 37,000 others, many of whom would die later from the effects of radi­a­tion poisoning. Three days later Bocks­car, another modified B‑29, exploded a second atomic bomb, “Fat Man,” over Na­ga­saki, 260 miles to the south, killing 40,000–75,000 people. By the end of 1945 total deaths in Naga­saki may have reached 80,000. Deto­nated hun­dreds of feet above their targets, the incred­i­ble down­ward pres­sure of the blasts and the ensuing fire­storms destroyed 50 per­cent of each city. Indeed, an esti­mated 40 per­cent of Japan’s built-up cities were devastated in U.S. air attacks in 1944–1945. On August 14, 1945, when Emperor Hiro­hito (post­humously referred to as Emperor Shōwa) announced to the Imperial Council his per­sonal deci­sion to accept the Allies’ terms for Japan’s uncon­di­tional sur­render, World War II was suddenly over—a war that had engaged the U.S. for three years and eight months and had killed 405,399 Americans and wounded 670,846. 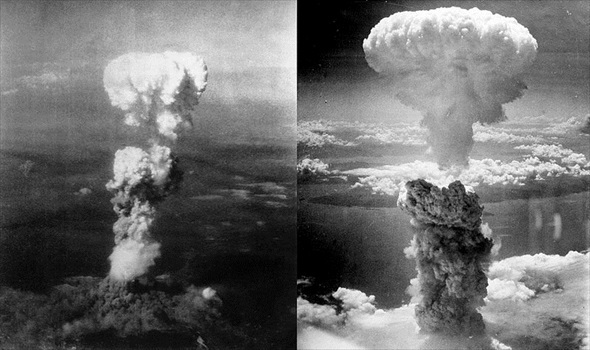 Left: At the time this photo was made, August 6, 1945, a column of radio­active smoke billowed 20,000 feet above Hiro­shima on the Japanese main island of Honshū, while smoke from the burst spread over 10,000 feet from the base of the rising column. Bad weather dis­quali­fied a target because scientists insisted on a visual delivery of the atomic bomb. The primary bombing target on August 6 was Hiro­shima, where impor­tant Japa­nese mili­tary instal­la­tions were located. Second­ary and ter­tiary targets were Kokura and Naga­saki, respectively, both cities on the southernmost Japanese island of Kyūshū. 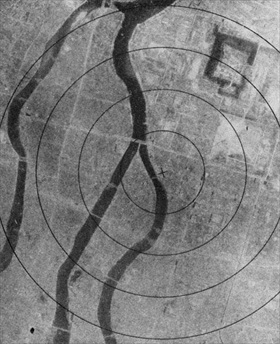 Right: Atomic bombing of secondary target Naga­saki, August 9, 1945. 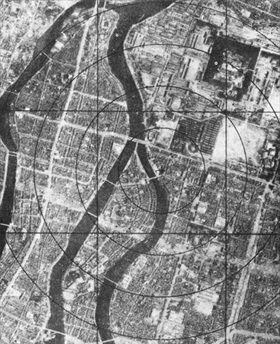 Cloud cover over Kokura, the pri­mary target that day, inhibited a visual attack. A last-minute break in the clouds over Naga­saki doomed that city. The next day, August 10, Tokyo pro­tested the cata­clys­mic bombings in a letter to the U.S. government via the Swiss embassy. Left: Hiroshima, a metropolis of 300,000 people before the August 6, 1945, bombing. Despite a major Amer­i­can leaf­let air­drop cam­paign, warning citi­zens to evac­u­ate 12 of Japan’s mid-size popu­la­tion centers (Hiro­shima was not among the 12 listed), Hiro­shima’s popu­lace was caught com­pletely unaware by the nuclear cata­clysm that befell their city. Area around ground zero, the point on the ground directly below the air burst of the bomb. 1,000 ft circles.